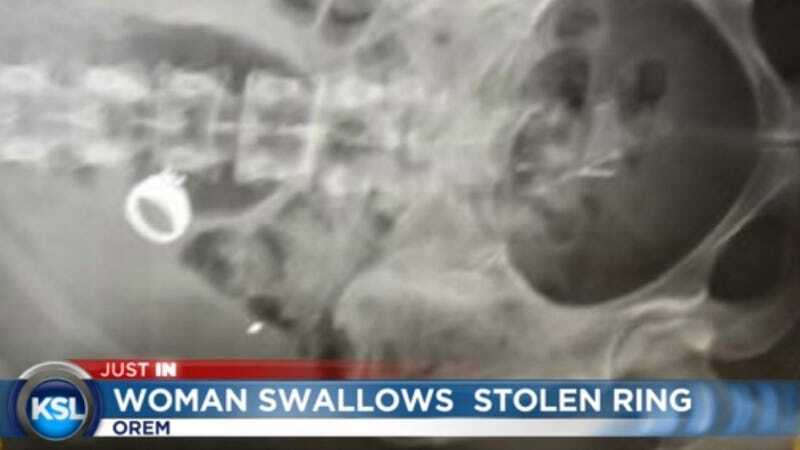 Here's a good reminder that your week could be going worse: A Utah woman, arrested for theft, is expected to poke through her own poop to recover a ring she apparently swallowed mid-getaway. Congrats, lady, you're a living cautionary tale. The Daily News reports that, according to the cops, 30-year-old Bryan Ford nicked a wedding ring worth several thousand dollars from a Zales store. He hopped into a car driven by his Bonnie, 25-year-old Christina Schlegel, and they burned rubber out of the parking lot. When the police caught up to the pair, they couldn't find the ring—until they X-rayed Christina's stomach. The pair were booked on felony theft charges and Christina deposited in a cell with toilet that doesn't flush and she'll be expected to dig through her own poop to recover the ring. "No, she hasn't passed the ring yet, and no, we're not digging it out," a police department rep told the Daily News. "We don't get paid enough to dig through people's bowel movements." Does anybody? Surely Zales has some sort of insurance policy for this sort of situation? Because I'm damn sure not buying any jewelry that's passed through someone's colon.